X It grows dispirited if it is not with kind people. It can float in midair without moving its wings. X Es wird entmutigt, wenn es unter unfreundlichen Menschen ist. Es kann ohne Flügel niedrig schweben. X Il se démoralise vite s’il n’est pas avec des gens sympathiques. Il peut léviter sans battre des ailes. X Si no está con gente amable, se entristece. Puede flotar en el aire sin mover las alas. X S’intristisce se non si trova con persone gentili. Può restare sospeso in aria senza bisogno di muovere le ali. X 상냥한 사람 곁에 있지 않으면 기운이 나지 않게 되어버린다. 날개를 움직이지 않고 뜰 수 있다. Y They say that it will appear before kindhearted, caring people and shower them with happiness. Y Man sagt, es zeigt sich nur gutherzigen und einfühlsamen Menschen. Es überschüttet sie mit Freude. Y On dit qu’il n’apparaît qu’aux cœurs purs et qu’il leur apporte la joie et le bonheur. Y Dicen que aparece entre gentes cuidadosas y de buen corazón, a quienes inunda de felicidad. Y Si dice che appaia alle persone buone e premurose, inondandole di felicità. Y 마음 착한 사람 앞에 행복을 가져다주기 위해 모습을 나타낸다고 전해진다. Omega Ruby Togetic is said to be a Pokémon that brings good fortune. When the Pokémon spots someone who is pure of heart, it is said to appear and share its happiness with that person. Omega Ruby Togetic ist ein Pokémon, das Glück bringt. Wenn es jemanden trifft, der gutherzig ist, teilt es seine Freude mit dieser Person. Omega Ruby On raconte que Togetic est un Pokémon qui porte chance. Si ce Pokémon remarque quelqu’un doté d’un cœur pur, il apparaît et partage son bonheur avec la personne en question. Omega Ruby Dicen que Togetic es un Pokémon que trae buena suerte y que, si detecta a alguien que es puro de corazón, sale para compartir su alegría con él. 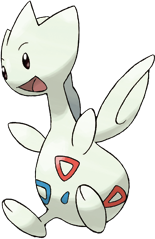 Omega Ruby Togetic pare essere un Pokémon di buon auspicio. Quando riconosce un cuore puro, si dice che condivida la sua felicità con questa persona. Omega Ruby 행운을 가져다주는 포켓몬이라고 전해진다. 순수한 마음을 지닌 자를 발견하면 모습을 드러내고 행복을 나누어준다. 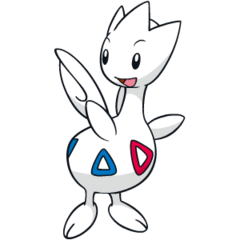 Alpha Sapphire Togetic is said to be a Pokémon that brings good fortune. When the Pokémon spots someone who is pure of heart, it is said to appear and share its happiness with that person. Alpha Sapphire Togetic ist ein Pokémon, das Glück bringt. Wenn es jemanden trifft, der reinen Herzens ist, zeigt es sich und teilt sein Glück mit dieser Person. Alpha Sapphire On raconte que Togetic est un Pokémon qui porte chance. Si ce Pokémon remarque quelqu’un doté d’un cœur pur, il apparaît et partage son bonheur avec la personne en question. Alpha Sapphire Dicen que Togetic es un Pokémon que trae buena suerte y que, si detecta a alguien que es puro de corazón, sale para compartir su alegría con él. Alpha Sapphire Togetic pare essere un Pokémon di buon auspicio. Quando riconosce un cuore puro, si dice che condivida la sua felicità con questa persona. Alpha Sapphire 행운을 가져다주는 포켓몬이라고 전해진다. 순수한 마음을 지닌 자를 발견하면 모습을 드러내고 행복을 나누어준다. Gold They say that it will appear before kindhearted, caring people and shower them with happiness. Silver It grows dispirited if it is not with kind people. It can float in midair without moving its wings. Stadium2 They say that it will appear before kindhearted, caring people and shower them with happiness. Ruby Togetic is said to be a Pokemon that brings good fortune. When the Pokemon spots someone who is pure of heart, it is said to appear and share its happiness with that person. Sapphire TOGETIC is said to be a POKeMON that brings good fortune. When the POKeMON spots someone who is pure of heart, it is said to appear and share its happiness with that person. Emerald It is said to be a POKeMON that brings good fortune. When it spots someone who is pure of heart, a TOGETIC appears and shares its happiness with that person. Diamond It is said to appear in front of kindly people to scatter a glowing down called "joy dust." Pearl It is said to appear in front of kindly people to scatter a glowing down called "joy dust." Platinum To share its happiness, it flies around the world seeking kind- hearted people. Black To share its happiness, it flies around the world seeking kind- hearted people. White To share its happiness, it flies around the world seeking kind- hearted people. White 2 To share its happiness, it flies around the world seeking kind- hearted people.